200gr Golden Delicious apples (about 1 apple normal). 400g sugar (your choice if normal or cane or mixed). 1 glass of red wine (abundant). Take apples, peppers, chillies and shallots, cleaned and cut everything small to medium sized pieces. Pour into a saucepan with sugar and wine and cook over a fire sprinkle with low flame for an hour. Mix all together with mixer or immersion blender, and return to boil least 1 / 2 hour or to desired consistency. Pot and invert the jars to cool. If we want a more long conservation, put the cold jars in a pot with cold water and bring to boil for about 15 minutes. P.S: With this procedure we have about 1kg of jam that can be too much. To get a smaller amount to reduce the dose proportionally. The spiciness varies by type of peppers you use. The jam so obtained results sugary with an aftertaste of peppers and then explodes in a pleasant spicy. And is good with boiled meat or cheese but also with a simple piece of bread. 3 generous tablespoons of acacia honey. Clean and slice in small-medium pieces the jalapenos, shallots and apples. In a pan put some green onion, 50g. 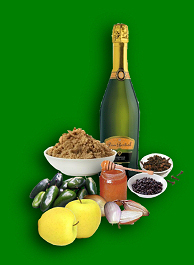 sugar cane, the whole sparkling wine and spices, bring everything to boil and reduce until you get a syrup. In the second pot put all other ingredients over low heat with Flame spreader for about an hour, then mix all together and add the reduction of prosecco. Put on the fire until desired consistency. To see the first recipe storage. P.S: The jelly thus obtained, compared with the first recipe, is much more delicate, slightly spicy and above all just peppers Jalapegno that, to my taste, are a good compromise between taste fruity and spicy. It's less dense 'cause it lacks the full-bodied red pepper and red wine, so I would not do pairings with dishes too strong .. but the choice is yours. Chop all together by adding the oil a little at a time. Once you do that put in the refrigerator until a few minutes before the course. Great on grilled meat, mild refreshing with fish. Preparation time 10 minutes. 2 tablespoons unsweetened cocoa powder. Boil the cream, sugar and red pepper, cut in half. Melt the chocolate in a double boiler. Putting it all together and when the mixture has become lukewarm add the vodka and remove the chili. Keep in refrigerator for 3 / 4 days, it should be served cold. 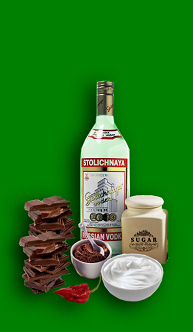 P.S: If the mixture is too thick, full-bodied,help with some milk or cream, for the most daring increase the dose of vodka. Peel the mangoes, Privatel the core and reduce the flesh into thin slices. Peel the onions, reduce also into thin slices and sauté over low heat in saucepan with butter and pepper. Add sugar in 2 liters of water, a pinch of salt and cook for another 15 minutes over low heat, stirring often. Then add the slices of mango and vinegar and continue cooking for 35 minutes. Chill the mixture and store in the fridge for up to a few days. For longer storage, sterilize the jars by putting them to boil for 30 minutes starting with cold water, fill them with the mixture and capovolgeteli. Rigirateli after 10 minutes and let cool. The recipe can be customized by changing the amount of sugar or type of onion, but above all, a lover of chili I'd recommend the fresh one but the choice is yours. Bon Appetite! -60 ml of cream (the type to be fitted). -1/2 teaspoon red chili pepper, for convenience 'choose the one reduced in impalpable powder, not the flakes, but if you have fresh, just get one, you open it and remove the seeds and the placenta. -160 grams of milk chocolate of excellent quality, broken into small pieces. Pour the milk, cream and chili powder or fresh in a pot or in a milk jug. Cook over medium heat until boil (about 4 minutes) after which remove the fresh chili if you have used it. Add the chocolate and beat with a whisk until well melted and well blended with the rest, about 2 minutes. Serve this hot chocolate, perhaps accompanied with some biscuits. First, prepare the batter: mix a tablespoon of flour, a tablespoon of potato flour, a pinch of salt and one of ginger powder, then diluted with 50 ml of ice water. Mix well and let stand in refrigerator for at least half an hour. Meanwhile, wash the peppers Aji orange, dry them thoroughly, and start grooving on one side to prevent it from bursting during cooking, then lightly flour (TIP OF, minutes before frying leave the mixture in the freezer will give the best results). Heat the vegetable oil until it reaches the temperature of 180 ° C, then dip one by one the orange Aji chiles into the batter and fry till it will not be crispy. Serve the tempura aji hot peppers, just ready. The orange Aji chiles are stuffed with a spicy appetizer or a great stuzzicchino quick to prepare. The nature of the Aji chiles (slightly spicy) makes them suitable to be eaten whole after a short passage in the oven anyway and stuffed with cheese smoked cheese softens the spiciness that goes wonderfully with their delicate flavor and fruity then if everything is tasted with a good cold beer, unfiltered and slightly tart the game and 'done. To prepare them, thoroughly wash the peppers Aji orange, also engage an incision length-wise and remove seeds and placenta (not mandatory, depends on how spicy you want to get). Then fill them with bits of smoked cheese. If necessary, close the flaps of the chiles with a toothpick. Arrange the stuffed chiles Aji in a pan lined with parchment paper and bake at 180 ° C for about 10-15 minutes, until it will not be melted provolone and hot peppers are cooked. Serve the peppers stuffed Aji hot. Mix all the cheese and fill the peppers coarsely gratuggiati previously cut in half without going overboard. Place them on a sheet of baking paper in a baking dish. In a bowl, mix the eggs, milk, flour and pepe.Versa the mixture into chilies and bake for about 45 minutes on a preheated oven at about 180 degrees until the eggs rassodino. To get a taste medium hot chillies are recommended as Jalapeno, Poblano or Rocoto and the like but if you want to try with chillies stronger the choice is yours and the taste buds, good apetito. (spicy recipe and we have the equipment for steaming). 1 leaf of lemon verbena (if found). 2 teaspoons of cumin powder. Take half the lemon rind and cut it into fine sticks. Wash the coriander and remove the leaves. Peel the garlic and onion, cut and pass them to the blender. Add the lemon juice, coriander leaves and the rest of the spices. Peel the ginger and grattuggiarlo. Melt a knob of butter in a saucepan, add the curry, wine, alcohol, coconut, orange juice, ginger and lemon verbena, then bring to a boil for two minutes. Incorporates, with the aid of a whip, the rest of the butter. Peel the shrimp and cook in steam for two minutes. Arrange on a plate and sprinkle with hot sauce. One of the methods for the conservation of the chillies is the mousse and in particular for the Habanero from store in the freezer. It 'just the habanero blend together in a bit of olive oil until well blended to form a cream that will be stored in the freezer. It will be possible to separate out parts with a knife whenever you want, leaving what remains frozen. The mousse can be used for gravies, sauces, and pasta dishes, and for the more daring, spread on toasted bread and rolls, good apetito. 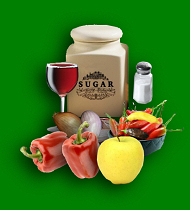 You take a glass jar with a large base and sprinkle the bottom of salt. At this point, alternate layers of fresh chilli and well-pressed layers of salt to fill the jar. The salt has a ’ very high storage capabilities. The mode of use of the chili are the same as capers, therefore, to occurrence, you take the part of the stored product we need and closes the jar. This conservative system is good for all kinds of chilies but it is great for those more meaty. Prepare a pastry tart of two eggs, or for anyone who is not very practical tarts we are prepared and ready-dosed. Divided into two parts the pastry and roll in order to create two circles equal. Place the first circle on the bottom of a buttered baking dish and sprinkle with a layer of orange marmalade (also for the jam you can do it or get it ready) above which spalmeremo a thin veil of chilli jam. We cover the whole with the second circle of pastry tightening along the edge. Cook for about thirty minutes and … good breakfast! 1 pinch of chili powder, but if we are in season or frozen, we use the fresh one (I prefer Jalapeno or Rocoto but the choice is yours). Heat the oil in a large skillet and brown the onion over high heat. Brown the meat in the same oil. 20cl Add broth, beans, spices and flavorings. Bring to a boil, reduce heat and simmer for one hour, stirring occasionally. Take a bit of broth in more for every eventuality. Serve hot. PS: This is one of the many recipes for chili that you can find. 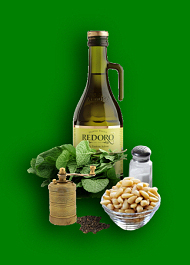 Type and quantity of the ingredients can be changed at your convenience. It turned out a meaty chili and spicy, but the flavor. This cream should be used with caution: on toast will be a success, but warn your guests before her hotness. Depriving the stalk and chilli seeds. Chop all ingredients together with a mixer. It is preserved in the refrigerator for a few days. The zucchini flowers fried in spicy batter are a very tasty appetizer, a fried crispy and lightly enriched with a hint of chilli. Ground chili pepper according to your taste and resistance to hot ...! To prepare, first mix in a bowl the egg yolk and flour, season with a pinch of salt and nutmeg and hot pepper ground, then dilute the batter with spicy ale ice, adding it little by little and mix thoroughly to avoid lumps. Let the batter rest in the refrigerator for half an hour (more if you can so that it is pretty cool), then add the egg whites and mix thoroughly. Meanwhile, rinse the flowers quickly under running water and let them dry on a clean cloth, then clean them by removing the stems and pistils. Heat the oil in a frying pan abundant virgin olive oil, then dip one at a time the zucchini flowers in spicy batter and fry quickly (takes just minutes), stirring halfway through cooking, until the batter will not become puffed and golden brown. As you are ready, place temporarily fried zucchini flowers in spicy batter on absorbent paper towel to remove excess oil, then serve hot or warm, with salt and chili powder if necessary. Here is the Mexican avocado sauce, to serve as aperitvo accompanied by nachos and hot spicy sauce, sipping cold beer or margarita. Finely chop the onion with the knife, the peppers (removing the seeds) and tomato (after removal of skin and removed the hard part center) and put them in a bowl. Peel the avocado with a potato peeler, divide it in half lengthwise and remove the big kernel. Immerse immediately in the flesh squeezed lime juice, not to make black. The secret to good guacamole is definitely using ripe avocado, that the pressure of the fingers, should be soft but not too soft. Cut the avocado into cubes with a knife, finely, crush it with a fork, making a mush and merging it with other vegetables in the bowl. Add the red pepper, salt, mix well and serve immediately. In Mexico, guacamole is served accompanied with fresh cilantro and lime wedges dipped in salt. PS: This is not 'the original classic Mexican recipe, in the internet there are many variations, if you also have your own personalized recipe or tricks to complete this recipe, please contact me. Remove the stem and seeds, and eliminating empty Jalapeno placenta. Stuff with soft cheese that does not melt completely in the heat of the oven we also add herbs like chives, thyme, basil or those that you like filling them completely. Place in oven brought to temperature about 180 ° to grill for 20 minutes. Serve warm. Quick and easy recipe in effect guaranteed that you can play with other types of chiles, make sure they are not too strong, but especially beautiful fleshy, good appetite. Here, simple and delicious, pumpkin jam in the slightly spicy version. I used to prepare Chilli Hot Lemon, because of their scent of lemon that pairs well with pumpkin. If you replace them with other chillies, add a teaspoon of lemon juice to the recipe. Spread the spicy marmalade on toast. Cut the pumpkin into cubes, the peppers in half and cleaned of seeds and stem ginger into small pieces. Bake one hour at low heat in a pot without a lid, if you need to add a little water. Whisk the mixture until creamy. Weigh it and add 1/4 of its weight in sugar. Put on the heat and cook another 10 minutes. Store in refrigerator in glass jars, previously sterilized to keep the jam longer re-create the vacuum. Grill the peppers and the garlic in a preheated oven at 180 degrees for about ten minutes. Peel them and deprive chilli seeds and stalk. Chop all ingredients until a creamy paste.